DETROIT, Mich.-Tuesday’s signing finale went to Detroit Communication & Media Arts senior, Joshua Harris. The standout athlete is set to rejoin his former high school coach (LaCema Womack) at Marygrove College. 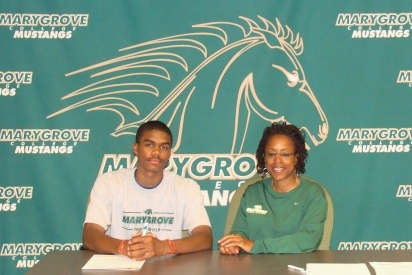 Harris, a 5’10” multi-sport athlete, comes to Marygrove as a highly-touted recruit after a successful high school career. On Saturday, Harris will head to the MHSAA State Championship Meet to compete in the 300m hurdlers. The All-City and All-Region wonder wowed the competition in field events such as the aforementioned 300m hurdles and the high jump en route to All-Area team honors. His junior season ended with an All-State 300m selection and an All-City honor in the 4×1, 4×2, and 4×400 relays. His distance efforts also helped CMA win the Cross Country City Championship. Coach Womack on Harris: Josh is an outstanding all-around athlete with great skills in field events. He is a great signing for our new program and will be a great asset for us from day one. I am excited to coach him once again next season!